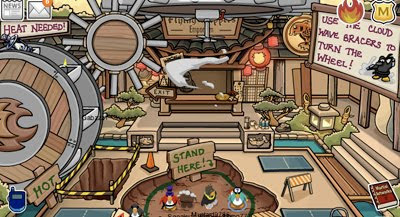 Club Penguin Cheats by Mimo777 Club Penguin Cheats by Mimo777: Club Penguin Sensei Savenger Hunt and Other Coolness! Club Penguin Sensei Savenger Hunt and Other Coolness! Ok, so there is a ton of coolness happening on Club Penguin Tonight! First thing is the Club Penguin Sky turned Organge! Why? Because you are supposed to "Prepare for a New Ninja Journey!" First go to the Town and click on the Fire icon in the upper right to start the Sensei Scavenger Hunt! To find the first item. Go to the Ski Lodge and click on the log in the fire. Next go to the Book Room Above the Coffee Shop and click on the Candle. Next go to the Pet Shop and click on the Black Puffle. Next go to the Underground at the Mine and click on the lantern. Next go to the Pizza Parlor and click on the Hot Sauce Bottle TWICE. Next go to the Cove and click on the stick in the fire. Next go to the Beacon and click the Jet Pack. Finally, go to the Dojo and click on the left Chinese Lantern. And you are done! The new FIRE PIN! SWEET CLUB PENGUIN CHEATS! So there is some major construction going on in the Dojo. And yes, I think this is because they are constructing a way to get to the new room, The Tallest Mountain! WOOT! So go to the Dojo, if you are a Ninja, put on your Cloud Wave Bracers and and stand in the green circle, you can make smoke! And the Wheel turns! COOLZ! Try it! HEY! WHEN I CAME ON CPG LIKE 10 MINUTES AGO, THIS WAS NOT THERE, AND SO I HAD TO FIGURE IT OUT BY MYSELF! AND NOW, YOU DECIDE TO POST IT? UGH! lol jk. i know why! sorry for ur grandpa. i hope he is ok.
hey mimo? in some of ur pics i saw some penguins and they wernt saying anything but like if i saw u on cp i would scream and ask u for a postcard and stuff why arnt they doing anything? did u just take pics with ur secret penguin ;) and add mimo on or somthing? i kno why its orange !!! Hey mimo!I don't no about u,but I feel a new mission coming on!!! awww i feel so sorry,i feel bad. at least u guys are lucky and he survied.Oh and the sky is orange in cp cuz we have fire and fire makes the sky turn orange.Becuz where i live we had a fire and the sky turn orange! Awesome! I cant wait to go to the tallest mountain! Sounds like sensei is coming again!!! Yeah for everyone. everytime i click on one of the items it comes up with an easter hunt thingy which is really random.. I don't think that this is for a new mission... maybe it will be an underground room or a tunnel to the tallest mountain. Yup, Sensei is here! Use Mimo's Tracker to find his location! It's 100% accurate! I LOVE UR WEBSITE SOOOOOO MUCH!!! Pls vist mine and I might put ur banners on my website. Pls send me a meebo message via the meebo chatbox on the homepage. Pls can i be a cpg mod? Sorry about your grandpa as well, I hope he gets better! Hey Mimo, CHEAT ALERT! Your igloo's sky is blue, not orange. When the sky was aqua, Mimo was orange..
and now the sky's orange and Mimo's aqua! great got the new fire pin!i have the really old snow pin too.now all i need is the water pin to complete my card-justu collection!hope ur grandpa gets better! Mimo! At the Dojo where all the construction is all the items we searched for are on the wheel and it says HEAT NEEDED! I cant wait! I saw sensei on breeze! Great cheats Mimo! I'm so sorry about your Grandpa, my Grandma was recently in a car accident so I know how you feel. I just wanted to let you know I will be praying for your Grandpa and that he makes a quick recovery. Give us an update if anything else happens! uhg im not a ninja thats not fair! i think there will be samurais. Actually, the water pin has already come out last year or the year before! Sorry! It was a water drop from when the ppol flooded and we had the water party! But maybe there will be a different one out another time. Wow! Thank you! When I tried to log into Club Penguin it said Incorrect Password too! So what you said makes perfect sense seeing as I say Remeber My Password*! Lol I havenb't found any famous penguin yet. They probably didn't recognize him or he probably took the picture right before they started screaming like crazy. Stay tuned for the next Q & A! I think they are going to use the fire to blow up the dojo so we can reach the tallest mountain. Chobots and Club Penguin Rules! Hey. I THINK ITS A nINJA PARTY !!!!! Mimo... If you stay in the pizza parlor long enough and look at the oven in the corner, it will (randomly) become engulfed in fire ad the pizzas will burn. I wish I could get you a picture, but I don't know ur email. Don't give it to me tho, cuz then ud probably be bombarded with spam. Guys, the sky is not orange because it's fall, OR because it's a sunset either. somebody who didn't leave their CP name, but went by Anonymous said that the sky turned orange when they had a fire where they lived, that's true, where I live we have had a few fires, the fires always last a few days, so for a few days the sky is orange, and it is also kinda dark, that's probably why the lights are on. Hey Mimo! If you look on the bottom right of play.clubpenguin.com then you'll see a "E for Everyone!" Just wanted to tell you if you already didn't know! You Rock Mimo! mimo i think the orange sky is saweet! i also agree with u theres probably gonna be a new room on the tallest mountain. but from the skectch i think were gonna get to train to be samuri! I think it's going to be a volcano! I mean why do they want all of the penguins to stand in ONE spot that steam is coming out of? And they are dropping HOT items in! It just fits! NOW we know what all those black puffles around the island are for! kewl cheats dude! I'm sure everyone noticed, but the black puffle changed in the Pet Shop, didn't it? Do you think it'll stay like this, or do you think they'll change it back after the scavenger hunt? You Rock Mimo!! I really hope your grandpa gets better soon Mimo. My grandma was going through a rough time, and she's okay now. I'm sure your grandpa will be fine. Club penguin hid a few things in the fall fair about this firery ninja thing. 1- the black puffles, that if you are a NINJA they lit on FIRE. 2- "penguins at work" part in the clothing catalog has something to do with FIRE. 3- The news paper cover has a FIRERY black puffle and the "in focus section" has momething to do with the DOJO. DOJO, FIRE, NINJA... Get it. Hey, did you know that the Fire pin is pin # 100! Thanks for following me Mimo! This is why your site is my favorite by far! And a late post isn't bad as long as you still post it. Especailly for that reason. Ok bye!!! sry bout ur grandpa... it's the ghost month though, so "famine and diesease are roaming the world." Kinda sad, and its in the lunar calendar. but the cheats rock thx! its not the dojo thats the ninja hideout! Mimo, if you look at the ninja hideout on the convayor belt are the firey items. HEY! i just saw sensei coz of you mimo and its mornin! Sweet Cheats! Helped Alot. And Cool Tracker Below =D Helps Alot! I hope so its been...1...2...3... 260 days! What wha? I believe the sky is orange because Halloween is coming up so the sky so getting darker and they are putting the fiery objects is to turn the whole island into a giant jackolantern!! I logged on and was like O.....M...G! Normally, those clues are supposed to help you find the fire items youre looking for. Maybe its a glitch for you? You should put up a cheat about the black puffels. know all you have to do is walk near them and they catch on fire!!! Nope, only in the Cortyard and the Ninja Hideout. Weird Eh? Pretty, cool! I met Sensei in July, but not this time. This is the 100th pin! The CPG was the greatest thing that happened 2 me, for sure! Mimo, i will definitly keep visiting ur site & attending ur parties, but it's time for me to quit MODDING. Mimo, if you don't know this, I want credit LOL! Ok well if you go to the beacon, look through the telescope you'll see the back of the Migrator! Ok mimo I have one thing to say, and that's, OVERALLS ARE SO IN ON CP! EVERYONE ARE WEARING OVERALLS! ITS SO CUTE! HOPE EVERYONE KEEPS IT UP! yup mimo said he feels a mission coming and i feel ones acomin too! yipee! i love this pin! its sooo COOLIO!! mimo, did you notice all of the black puffles around? here's a quick tip for all you people struggling to be a ninja --quick! If you lose, choose the same card you lost with. If you win, choose what your opponent chose. Remember, be quick and random like a ninja! Cool! I did not know that! So sorry for your grampa! My grandaddy died of cancer (I think) when I was 2. My other daddy died when I was 5 but I never saw him. I know what it is like to have a hurt grandaddy. -----------------------------------They have already had a water pin and a snow pin. We got the water pin from a flood about a year ago. Now we have the fire pin! Hey cool I met Mimo too when I met Rockhopper(the salad time).